The superior pharyngeal constrictor muscle is a muscle in the pharynx. It is the highest positioned muscle among the three pharyngeal constrictors. The muscle is quadrilateral muscle, which is thinner and paler compared to the inferior pharyngeal constrictor muscle as well as middle pharyngeal constrictor muscle. Pterygopharyngeus part – From the inferior half of the posterior border of the medial lamina of the pterygoid process. Buccopharyngeus part – From the pterygomandibular raphe. Mylopharyngeus part – From the mylohyoid line of the mandible. Glossopharyngeus part – From the mucous membrane of the Hoor of the mouth. The muscular fibres spread out backwards, and are attached into a raphe outspreading down the posterior wall of the pharynx within the median plane, for the most part. The highest fibres are attached to the pharyngeal tubercle of the occipital bone and the lowest fibres are covered from the middle constrictor. 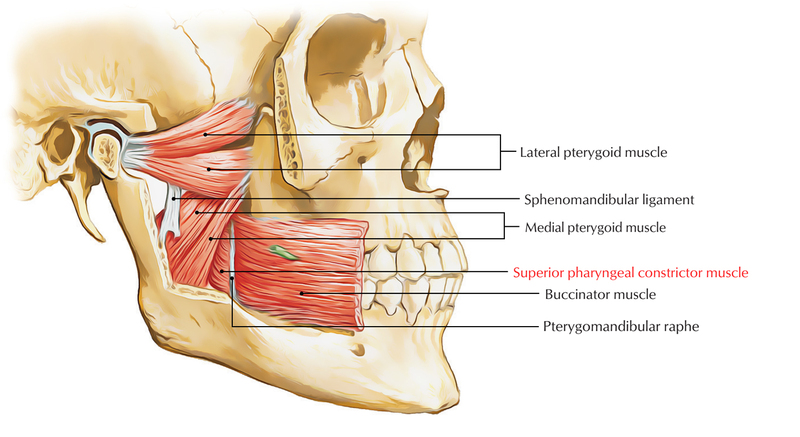 Below the base of the skull, a crescent gap occurs above the muscle in which the auditory tube and the levator as well as tensor veli palatini muscles arise. The stylopharyngeus muscle separated its lower margin from the middle constrictor. The constrictors contract upon the bolus and transmit it down inside the esophagus. The pharyngeal branch of the vagus nerve via the pharyngeal plexus supplies the superior pharyngeal constrictor muscle.